Dr. Zoolittle stumble upon a new set of trails as he continues the adventure to meet his exotic friends! 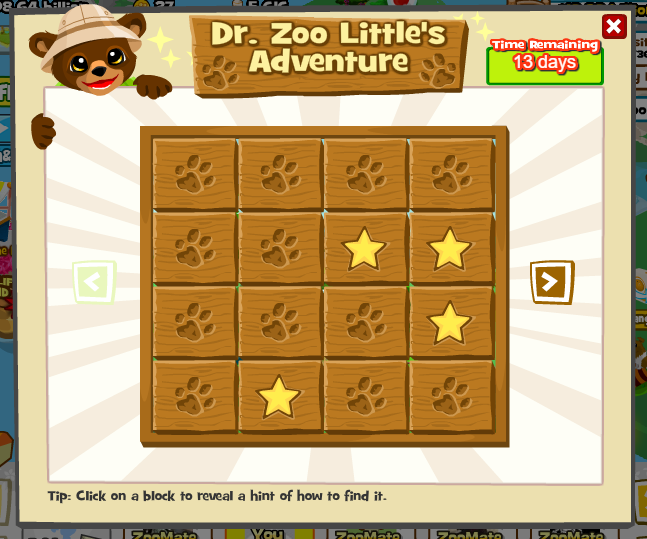 Help Dr. Zoolittle in finding the clues and solve this mystery to bring them back to your Zoo! Similar to the previous adventure, there are 2 animals this time. Remember, these animals are exclusive to this adventure! This special block puzzle is made up of 2 kinds of clues that reveal them! These are the Common Clue Block and the Cryptic Clue Block! Reveal a block by completing tasks or unlocking with WLP. Common Clue Blocks can be revealed by feeding animals, breeding, and collecting from Zoomates’ Zoos! Cryptic Clue Blocks require a set objectives which must be completed. Hold your horses, you can only unlock 3 blocks a day so watch it unfold with time! What are you waiting for Zookeepers! Start chipping away at those blocks! This entry was posted in Uncategorized and tagged ad, adventure, Zoo World. Bookmark the permalink.